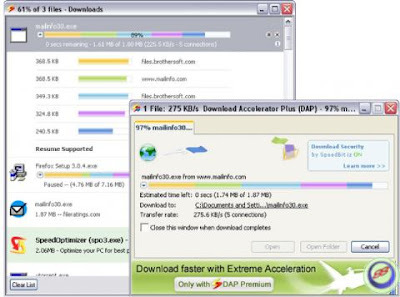 Download Accelerator Plus (DAP) is the world's leading download manager, allows you to download up to 300% faster* with increased reliability, resume support and errors recovery. It searches for mirror sites that most effectively serve your downloads through multiserver connections for optimal utilization of dial-up or broadband connections. DAP automatically recovers from shutdowns, lost connections, and other errors. It is fully integrated into Netscape, Internet Explorer, and Opera, Mozilla/Firefox and offers a toolbar for Internet Explorer with a links catcher and a highlighter, providing the best possible performance from ANY Internet connection (dial-up, cable, DSL / ADSL, T1 etc. ), allowing a Faster and more Reliable download experience. It features auto-hang-up after downloading, proxy settings, scheduling, and a unique AlwaysResume service.